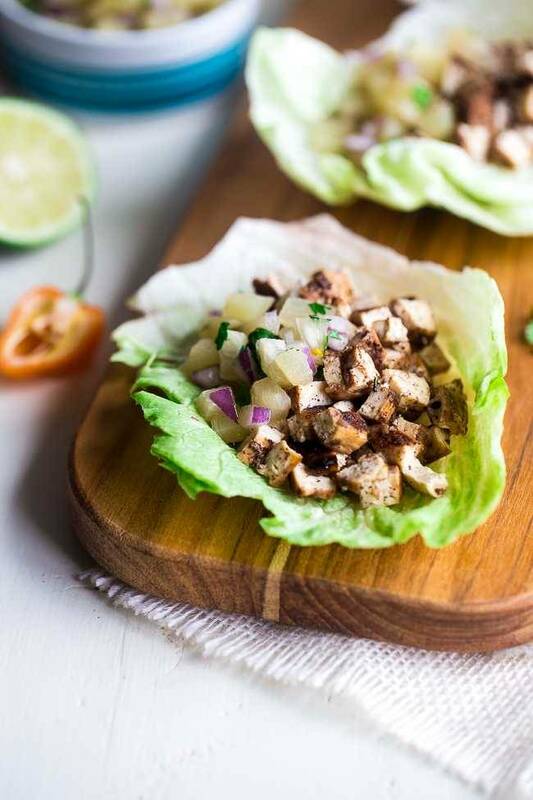 These easy vegetarian lettuce wraps are piled with spicy-sweet Jerk grilled tofu and pineapple salsa. They’re a quick and easy, healthy meal for Summer grilling! How was the weekend? Mine was pretty uneventful since Mr. FFF was working graveyards all weekend long. You know, just had some good bonding time with my dog. Don’t be jealous of the wild and crazy life I lead guys. Can I try to distract with perfectly tender-crisp meatless lettuce wraps filled to the BRIM with grilled crunchy-on-the-outside-but-so-smoooooooooth-and-creamy-on-the-inside, itty-bitty pieces of the best spicy-sweet House Foods Tofu (<3) and E-A-S-Y pineapple fruit salsa, that your face has ever eaten? Yes, yes I can. I know the way to your heart. Let’s just pow-wow for a second though, and talk about the grilled shenanigans going on in these easy vegetarian lettuce wraps mmkay? If you’ve tried to grill tofu before, you may have had a major SAD FACE 🙁 experience when it stuck to the grill, was mushy and just generally not what your crunchy-tofu-person-loving self had in mind. To grill tofu, you want to cut the brick of tofu in 3 inch slices. You will then want to lay the slices on paper towel and really press out the moisture. Repeat until you have pressed out as much moisture as possible! If using a marinade, like we are here, now is the time to let that tofu soak! Preheat your grill to high heat. Once heated, turn down to low and place the marinated tofu on the outer edges of the grill, over indirect heat. Close the lid and cook until one side is crispy, about 10 minutes. Flip and cook another 10-12 minutes! There you have it! THISSSS Jerk-marinated grilled tofu, well, it is not a JERK at all because it’s, like, realllly crispety. See what I did there? Just laugh. PLUS PLUS PLUS, it even gets GRILL marks. Let’s be reals, we eat with our eyeballs first. If you give me something that’s grilled, I need to PEEP it on the food. I actually learned this technique from the interwebz, because I feared the above fate would come for this tofu. I meeeaaaan, it’s a LEEEETLE bit more work than just cutting it, slapping it on the grill and calling it dinner. But, if you do that, you might not be calling it dinner. And really. It’s not extra WORK, just some extra time waiting, ‘cause this tofu needs to be cooked on some IN-direct heat and looowwww and slow. But, doesn’t most good food need to be? 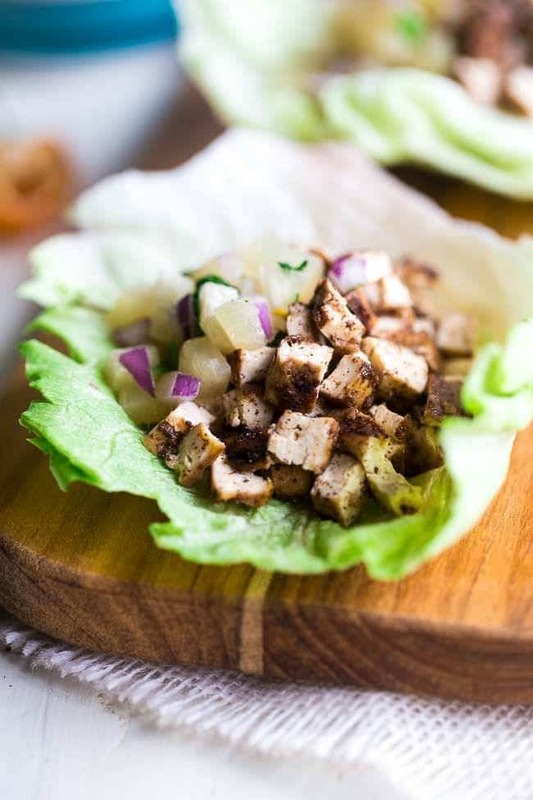 When making this tofu lettuce wrap recipe, you also want to cut your tofu into SLABS. Read: Like, really REALLY thick. Oh and don’t forget to press the water out before grilling. I mean, that pretty much goes for ANY tofu cooking method. But, maybe you got so distracted by the alllll the YUM going on here, that you’re brain just kind of forgot key points. I wouldn’t blame you. It happens. Especially when I know you want to start your week by stuffing your face with meatless NUMS. AKA: Juicy, fresh pieces of summer-food pineapple all mixed with that spicy-sweet-smoky-crunchy texture-freak-self-is-majorly-loving-this grilled tofu. It’s not a traditional jerk recipe. It ain’t no easy jerk chicken recipe or jerk shrimp stew. 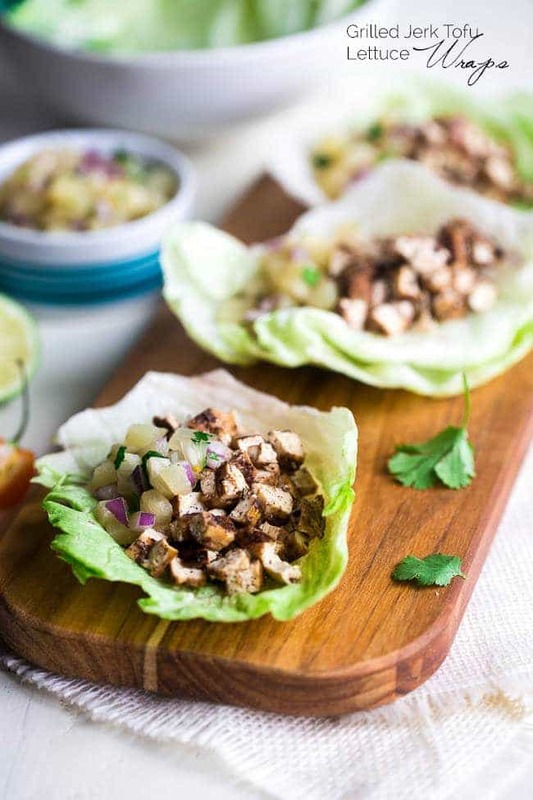 Regardless, I am asking you to banish your previous notions of tofu-on-the-barbie guys, because these easy vegetarian lettuce wraps are not a sad face at all. Meatless Monday. It NEEDS YOU. And it would be rude to not give it what it asks. 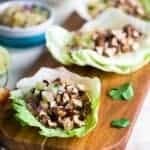 Which is this vegan lettuce wrap recipe. Just FYI. 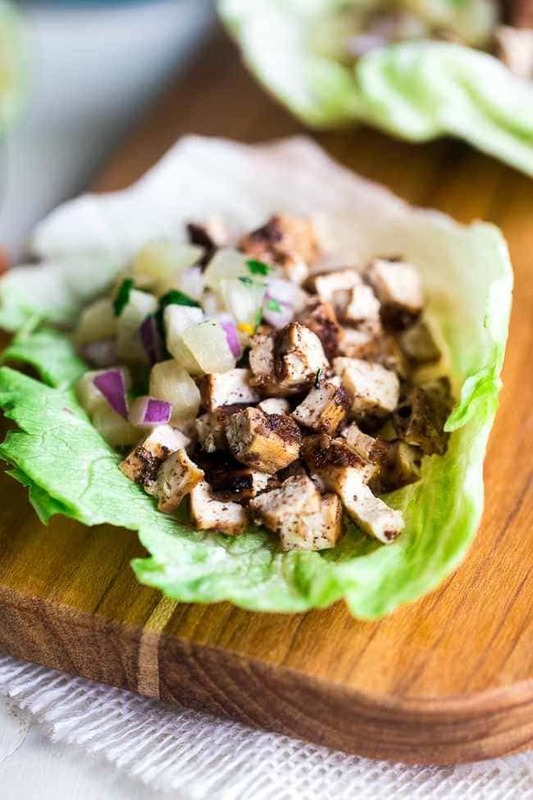 These easy vegetarian lettuce wraps are piled with spicy-sweet Jerk grilled tofu and pineapple salsa. They're a quick and easy, healthy meal for Summer grilling! In a small food processor (mine is 3 cups), combine the chili, red onion, ginger, garlic, thyme, cinnamon, allspice, nutmeg, coconut sugar, soy sauce, lime juice, oil and a pinch of salt and pepper. Blend, scraping the sides down every so often, until a slightly chunky paste forms. Set aside. Cut the tofu in half, and then cut each half into 3 slices, each about 1/2 inch thick. 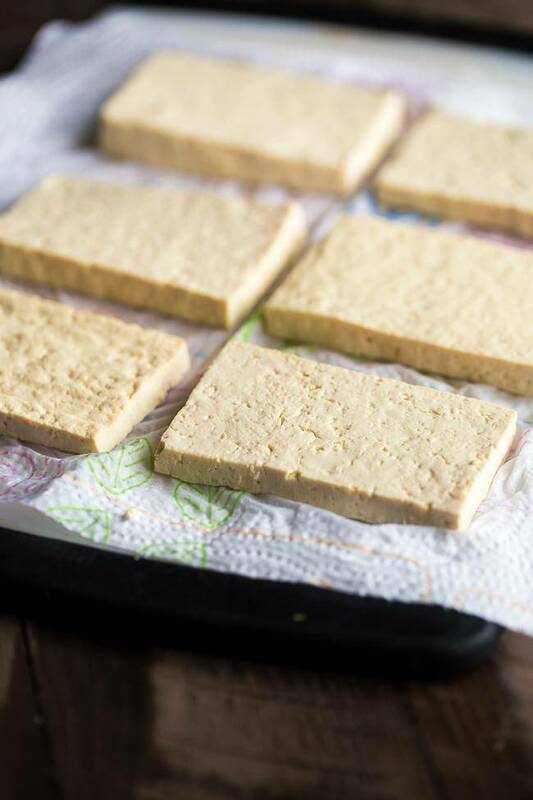 Place the tofu on a layer of paper towel and then cover with an additional layer and press out the moisture. Repeat with new paper towels until you've squeezed as much moisture out as possible. I did this 4 times. Place the tofu in a large dish and pour the marinade over top. Turn the tofu over and rub the marinade on top to make sure both sides get evenly coated. Cover and refrigerate for at least 2 hours - overnight. Preheat your grill to high heat for 10 minutes. Once hot, scrape the grill down really clean and rub it generously with olive oil (a super clean and oiled grill is one of the keys to crispy tofu). Scrape any excess chunks of marinade off the tofu, and place the slabs on the OUTSIDE edges of the grill, where the heat is indirect and turn the grill down to low. Close the lid and cook until the outside of the tofu is lightly crispy and has nice grill marks, about 10-13 minutes. Flip and cook an additional 10-13 minutes. While the tofu cooks, combine the chopped pineapple, red onion, lime juice and cilantro in a medium bowl. Season to taste with salt and pepper. Once the tofu is cooked rub the reserved excess marinade on each slab and finely chop into small cubes. Spoon the tofu into the lettuce leaves, top with salsa and DEVOUR. This post is sponsored by House Foods. Thank you so much for allowing me to continue creating great recipes for you by supporting partnerships with super-fab brands that Food Faith Fitness loves to work with! Keep in touch with House Foods for more delicious recipes on Facebook! 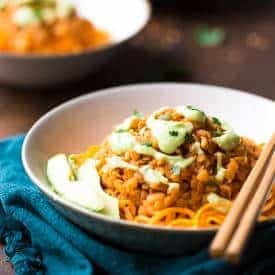 Want more easy meatless meals? You are so welcome girl, I figured I should save you from an unfortunate experience 🙂 Happy Monday! I think she will like it once she tries it grilled! Ha! Thanks carla! I’ll trade meat for some of these yummy wraps any day! Love them , T! Oh I love lettuce wraps! 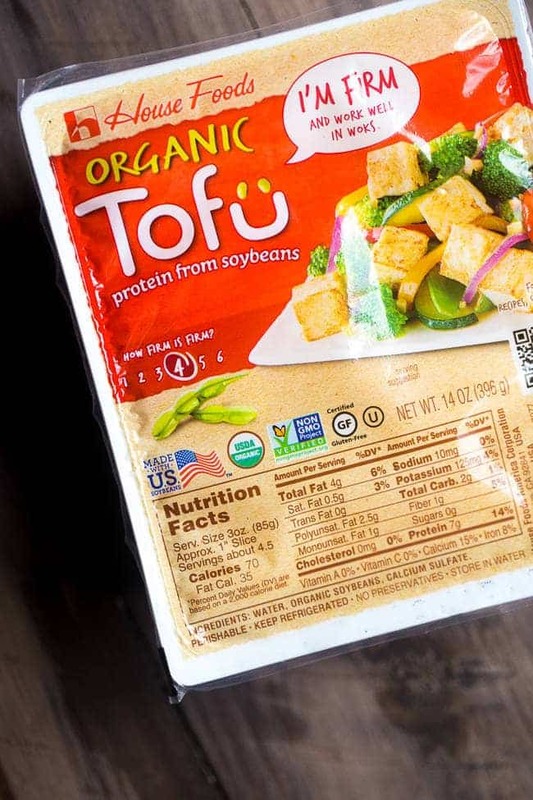 I’ve never thought to make them with tofu before…love this, Taylor! And I love the zesty seasonings, too. What a great dish! Pinned! Jerk seasoning is one of my favorite ways to spice things up! YESSSSS. I have been faceplanting that tofu like a boss and now have a new way to enjoy it- JERK TOFU. best. ever. YESSS then you will LOVEE this! And happy birthday friend – thank you! 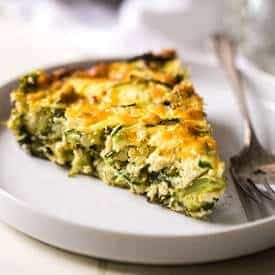 Oooh, my veg clients will love this recipe! Taylor! How did you know I was craving lettuce wraps?! You’re the best for thinking of me, lol. 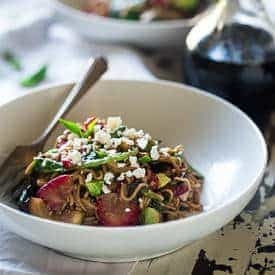 I can’t wait to whip these up for a healthy week night meal! I TOTALLY planned these just for YOUR face! 😉 Thank you Heather! You’re right, tofu can be tricky. You nailed it! I’ll have to look for that brand…it looks GOOD! Would you believe that I’ve never had tofu before? I think I need to change that stat, though, because this looks amazing! UMM SAY WHAT?! You are missing out girl! Thank you! I JUST pressed my first slab of tofu a couple of weeks ago, so I am armed and ready to go for this recipe! I’ve never thought to grill tofu and I bet it comes out with soooo much flavahhh!! Love these wraps, m’dear! Haha, it’s like you KNEW! 🙂 Grilling is totally the way to eat yo’ tofu girlfrannnnd – thank you! I am coming onto the love train too! Thank you Hannah! So happy that I have tofu in my fridge so I can try these! I love lettuce wraps. 🙂 Messy, but oh so good. Unfortunately, to make a “true” Jerk, you need a lot of them! But thanks! I am all about Jerk too! Please let me know if you try it – thanks Rebecca! Happy Monday!!!! this looks awesome! I don’t have much skill with making the tofu taste flavorful… so I totally need to try your recipe next time I get tofu cause It looks totally- de-lish! plus I love that you put it on a lettuce wrap thats my favorite way to eat wraps!!! This tofu has ALL the flavah girl! Please let me know if you give it a whirl – thank you! Those lettuce wraps are SO up my alley. I’ve been eating a lot more vegetarian lately, so I’m def going to try these! Me too! I hope you love them as much as we did – thanks Alyssa! I’ve still never had tofu. I’ll be the first to admit, I’m scared. And I’m not scared of ANYTHING when it comes to food. Butttt you make it sound (and look) so good! I NEED to try it finally! Don’t be scared! I was at first too, but it’s so good!! Thanks girlfriend!! I’ve been looking for lettuce wraps for the longest time! So delish–thank you for making it vegetarian! I hope you love these Cassie!! Thanks! We have been loving lettuce wraps lately! I may have to try these for our Meatless Mondays! They’re my favorite! I hope you love them if you do try them – thanks Sandra! LOVE grilled tofu and all the spices you packed into this! It was great seeing you in Portland!!! YES! So great seeing you too girl! Thank you! What a great vegetarian option! I never thought of this with a lettuce wrap. 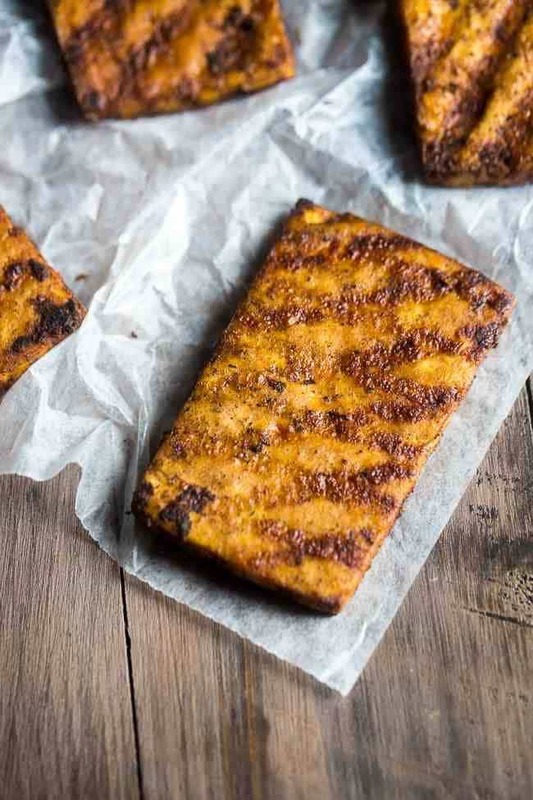 It never occurred to me to try grilling tofu – I’m totally trying this ASAP! I love everything and anything jerk, so this recipe is definitely right up my alley. It gives it SO much texture! Thank you Lauren!